Forever changes the beer drinking experience. For beer lovers that want their beer to taste great from start to finish, the Sonic Foamer will enhance the aroma, flavor, and joy of drinking your favorite beer. Unlocks the full potential of your beer. Ultrasonic waves create a unique foaming reaction that is different from anything you have ever seen. Creating the perfect new delicious beer head. The Sonic Foamer works and recovers the delicious beer foam head plus enchants the aroma. It’s so cool to look at and definitely a crowd pleaser. One button operation and BOOM sonically foamed. The Sonic Foamer creates a healthy head on the beverage. The big advantage of this technology is that it maintains the fizz and provides an aroma boost for your beer. Sonic Foamer was recently featured on The Tonight Show with Jay Leno, one of the most popular hosts of the world’s longest-running entertainment program in the United States. We asked a few craft beer enthusiasts to test out the Sonic Foamer, ask and answer some common questions/complaints we’ve received from our customers, as well as give the bottom line on the Sonic Foamer’s contribution to the ultimate craft beer experience. Get the Sonic Foamer for yourself or the beer lover in your life today. Make every sip as good as the first and wow the crowd with aroma. 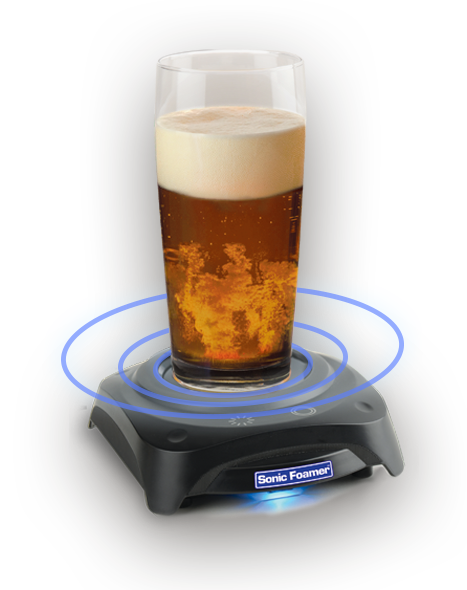 The Sonic Foamer is the best way to experience your favorite beer.